d= fdesign.ciccomp constructs a CIC compensator specifications object d, applying default values for the properties Fpass, Fstop, Apass, and Astop. In this syntax, the filter has two sections and the differential delay is 1. Using fdesign.ciccomp with design method creates a System object™, if the 'SystemObject' flag is set to true. d= fdesign.ciccomp(d,nsections,rcic) constructs a CIC compensator specifications object with the filter differential delay set to d, the number of sections in the filter set to nsections, and the CIC rate change factor set to rcic. The default values of these parameters are: the differential delay equal to 1, the number of sections equal to 2, and the CIC rate change factor equal to 1. If the CIC rate change factor is equal to 1, the filter passband response is an inverse sinc that is an approximation to the true inverse passband response of the CIC filter. If you specify a CIC rate change factor not equal to 1, the filter passband response is an inverse Dirichlet sinc that matches exactly the true inverse passband response of the CIC filter. d= fdesign.ciccomp(...,spec) constructs a CIC Compensator specifications object and sets its Specification property to spec. Entries in the spec represent various filter response features, such as the filter order, that govern the filter design. Valid entries for spec are shown in the list below. The entries are not case sensitive. fp — frequency at the end of the pass band. Specified in normalized frequency units. Also called Fpass. fst — frequency at the start of the stop band. Specified in normalized frequency units. Also called Fstop. The filter design methods that apply to a CIC compensator specifications object change depending on the Specification. Use designmethods to determine which design method applies to an object and its specification. h = fdesign.ciccomp(...,spec,specvalue1,specvalue2,...) constructs an object and sets the specifications in the order they are specified in the spec input when you construct the object. Typically, when they develop filters, designers want flat passbands and transition regions that are as narrow as possible. CIC filters present a (sinx/x) profile in the passband and relatively wide transitions. To compensate for this fall off in the passband, and to try to reduce the width of the transition region, you can use a CIC compensator filter that demonstrates an (x/sinx) profile in the passband. fdesign.ciccomp is specifically tailored to designing CIC compensators. You can design a compensator for CIC filter using differential delay, d, number of sections, numberofsections, and the usable passband frequency, Fpass. By taking the number of sections, passband, and differential delay from your CIC filter and using them in the definition of the CIC compensator, the resulting compensator filter effectively corrects for the passband droop of the CIC filter, and narrows the transition region. As a demonstration of this concept, this example creates a CIC decimator and its compensator. fs = 96e3;   % Input sampling frequency. fpass = 4e3; % Frequency band of interest. m = 6;  % Decimation factor. 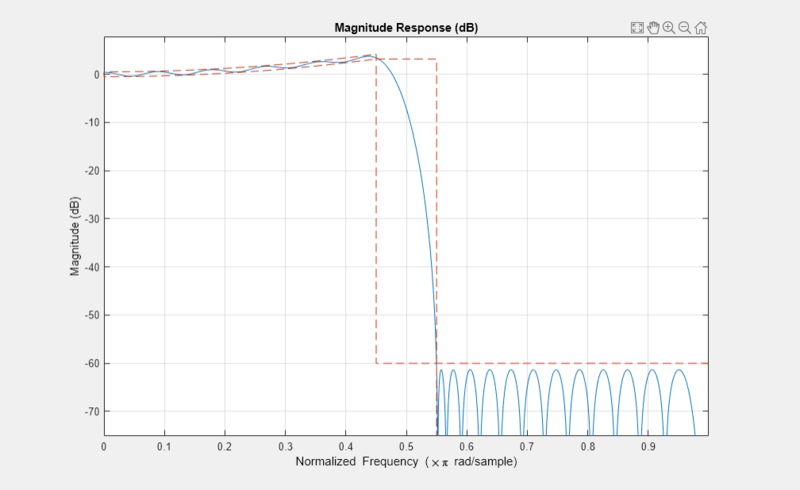 Here is a plot of a CIC filter and a compensator for that filter. Designed to compensate for the rolloff inherent in CIC filters, CIC compensators can improve the performance of your CIC design. This example designs a compensator d with five sections and a differential delay equal to one. 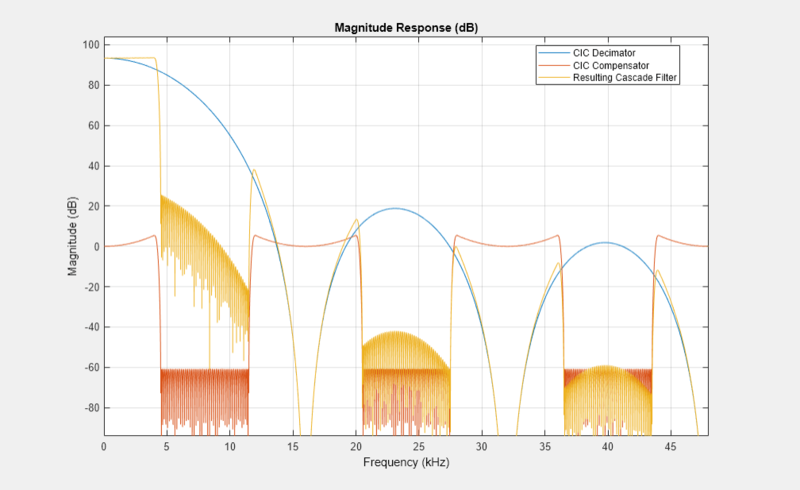 The plot displayed after the code shows the increasing gain in the passband that is characteristic of CIC compensators, to overcome the droop in the CIC filter passband. Ideally, cascading the CIC compensator with the CIC filter results in a lowpass filter with flat passband response and narrow transition region. This compensator would work for a decimator or interpolator that had differential delay of 1 and 5 sections.